Nevada has so much to offer beyond the glitz and glamour of the Las Vegas strip. Get to know this state’s gorgeous surroundings and rich history by taking a drive to truly appreciate the beauty that is Nevada. 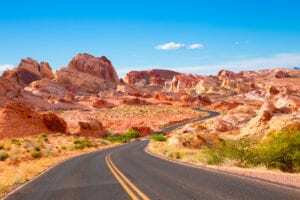 In as little as twenty minutes you can be in Red Rock Canyon exploring the natural beauty or an hour’s drive to the Valley of Fire to view ancient petroglyphs and petrified trees. A longer day trip takes you to the capital of Nevada, Carson City, where you’ll find a city filled with history and a true experience of the Wild West! Be sure to pack your camera for each trip. You’ll want to capture the beauty and endless photographic moments along the way. Located just 16 miles from the Las Vegas strip, this canyon offers 13 miles of scenic stops and trailheads ideal for all kinds of explorers either by car, bicycle, horseback, or foot. The wide, one-way road offers many pull out areas and ample parking to explore the desert trails within Red Rock Canyon. Whether you’re an amateur hiker or a professional rock climber, you’ll find all sorts of trails from deep canyons to high points. With twenty-six different hikes and trails to choose from based on difficulty, you’re sure to find the right trail for you. The Moenkopi Loop is perfect for beginners and those traveling with smaller children. This two-mile, easy hike, starting at the visitor center, averages about an hour and half to complete. Along the way you’ll spy Triassic fossils, desert vegetation, and a panoramic view of the Wilson Cliffs. This hike brings you over a prominent limestone ridge and intersects with other connecting trails to the Calico Hills area. For avid hikers, Grand Circle Loop is a great choice. This option gives you the best of many as it is a combination of trails that takes you through the center of the Scenic Drive. Starting from your choice of five different points, this trail wanders across desert foothills and through washes. For more information on the many trails and hikes, click here for a trail map. Camping is offered to visitors by recreational campers or by tent in designated areas. Conveniences such as restrooms and drinking water faucets are available. All campsites are equipped with picnic tables, shade structures, campfire rings, and grills. The Valley of Fire is a sight to behold with its bright red Aztec sandstone areas along gray and tan limestone mountains. The sandstone is said to be from the Jurassic period and is the result of the sand left behind from wind after inland seas dwindled and land rose. This ancient formation is said to have been occupied by man as far back as 11,000 years ago. Petroglyphs can be found carved into the rocks by the Basketmaker culture from about 2,500 years ago and later by the Early Pueblo cultures. Be sure to stop into the Visitor Center to view exhibits on the geology, ecology, prehistory, and history of the park and surrounding areas. Don’t miss the annual Atlatl (at-lat-uhl) Competition held in March where participants test their skill with replicas of ancient spears. The park is open year-round and offers campsites equipped with grills, water, and shaded areas along with trails for hikers. There are many different sights to see at the Valley of Fire, that may require multiple visits. A few include the Balanced Rock, Rainbow Vista, and Elephant Rock. Right outside the visitor center, you’ll find Balanced Rock, one of the many famous formations in the Valley of Fire. The valleys and ridges of Rainbow Vista were carved from sand around the same time dinosaurs walked the Earth. Rainbow Vista is a gorgeous view point where the road stretches to the top of a low ridge revealing a great area of multicolored rocks for miles. With so much color and panoramic views, this area is perfect for photographs. Elephant Rock is an arched rock formation in the shape of an elephant. A quick 1/3 of a mile trail will lead you to the formation to view it up close. The capital of Nevada, Carson City, is named in honor of Kit Carson, an explorer and mountain man. A rich and colorful frontier past, this city was founded in 1858 during the gold rush era. In a city full of history, there is so much to take in and explore. Shop for antiques along Curry Street or hike up Prison Hill for a 360-degree view of the city. Tour the Nevada State Capitol building and grounds, take the Kit Carson Trail through the historical district with over sixty stops at various landmarks including Victorian-style homes, museums, and churches. Larger, printed maps are available at the Carson City Visitors Bureau or listen to stories as you walk the blue line by downloading the VisitCarsonCity app to your smart device. Visit the Nevada Railroad Museum and learn about the heritage of railroads in Nevada including the locomotives and cars of the infamous Virginia and Truckee Railroad. Many museum activities are available including operation of standard and narrow-gauge railroad equipment, train rides, handcar rides, lectures, special events and more. Experience the V & T Railroad yourself with a trip from Carson City to Virginia City. You’ll wind down the track through tunnels, canyons, and mining towns aboard a 1914 Pullman coach led by a 1916 Baldwin steam locomotive. This all-day excursion is complete with narration of historical facts and other related anecdotes. The 24-mile round-trip tour includes a stop in historic Virginia City, where you can experience a taste of the Wild West by walking down the boardwalks, explore saloons, mines, restaurants, shops, and more. The V & T Railroad also offers special seasonal train rides including entertainment shows on the rail, wine tastings, a Polar Express experience, and other various exploration trips.